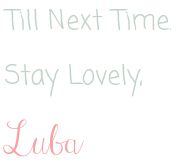 Since the moment I was born, and my parents named me Love (Luba means Love in Russian), I had a drive and passion for life. To live beautifully and to love with all of myself. I have a love for styling, and I want to inspire women to take care of themselves from the inside out. It all starts from eating a wholesome diet and active lifestyle. I started this blog as an outlet to share my passions and day to day life. It has a little bit of everything. When we were little girls, we played dress up. Why not continue to have fun with what you wear! Express yourself and have fun with it. A wife to an incredible man, and a mother to three little girls. A woman with a passion for fashion, fitness, beauty, and wholesome food. And most importantly, I have a relationship with God that I hold dear to my heart. I am on a journey and don't claim to know all the answers, however I am always learning and growing. Read a small part of my story here. Thank you for visiting a part of my life. Love your blog so glad I found it! You are so beautiful and look so healthy. Your wish for other women to feel beautiful too is inspiring.